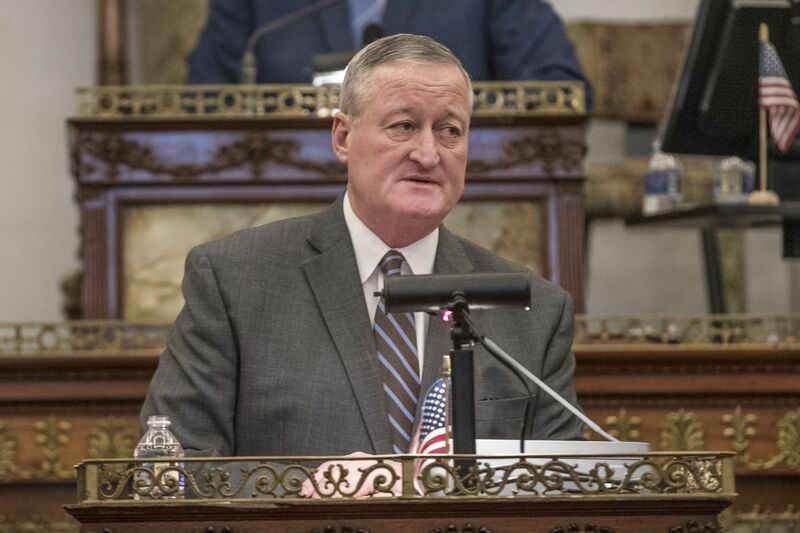 Philadelphia Mayor Jim Kenney, shown at his annual budget address recently, has proposed or enacted spending increases totalling 17 percent since taking office. When Mayor Kenney introduced his fiscal year 2019 budget, he asked for a $250 million increase in spending from this year's budget, for a total $4.7 billion. "This spending plan is lean. We have combed through every part of government looking for new efficiencies," Kenney said during his budget address March 1. The proposed increase represents 5 percent more than what the city expects to have spent by June 30, the end of the 2018 fiscal year. The jump from the year before was 8 percent — or $330 million. If his budget passes, the city's general fund spending will have increased by 17 percent, or $600 million, since Kenney took office in 2016. By comparison, the state has increased spending by 3.3 percent over the same span. City officials say much of the increase is due to fixed costs such as pensions, health care, and debt. On the "discretionary" expenses, the mayor says increasing funds for public safety, street paving, and the opioid crisis are needed to grow the city's tax base. "The mayor is committed to being a responsible steward of taxpayer dollars," Kenney's spokesman Mike Dunn said. "At the same time, the mayor feels strongly that the increases in spending represent crucial investments without which the City cannot move forward." Nationally, cities were seeing annual expenses grow at an average rate of 2 percent in 2017, according to a report by the National League of Cities. Mayor Kenney’s proposed $4.69 billion budget for fiscal 2019 represents a 17 percent increase in spending from Mayor Nutter’s final budget in fiscal 2016. "What we've heard is expenditures are rising and that's because cost of services are increasing," Christiana McFarland, research director at the league's Center for City Solutions, said in an interview Thursday. "Payroll, operating machinery, gas for their fleets — all the things that go into operating." To be able to balance budgets with rising costs, McFarland said, cities are increasing fees and "trimming around the edges where they can." In Philadelphia, there isn't much trimming. Kenney wants to add more employees in the Police, Fire, and Streets Departments. The mayor's 2019 proposal would authorize up to 23,454 employees, with most departments seeing an increase in staff or staying level. (Records show 22,120 city employees as of December.) When Kenney took office, the city had 21,329 full-time workers. The general fund pays for city operating departments, except for water and the airport. Payroll in general has also increased by 10 percent — from $1.56 billion in fiscal year 2016 to proposed $1.72 billion for fiscal year 2019 — in part because of recent contracts with AFSCME District Council 33 and the Fraternal Order of Police that granted annual pay raises for each year of their respective three- and four-year contracts. As part of the city's five-year plan, officials want to reserve $200 million for new labor contracts, including the firefighters and District Council 47, both of which expired in June. But if previous contracts are any indication of cost, the $200 million will cover only a fraction of the increased costs. The Kenney administration also added a new line item to the budget: a reserve of $53 million in case the federal government takes a red pen to what it gives Philadelphia. While the 2019 proposed budget includes a $72 million increase in the city's contribution to the School District — for a total of $176 million — the budget does not include money proposed to be raised via a proposed 6 percent property-tax increase. The city wants to raise the levy on the school tax side to generate $475 million over five years for the district. "I don't think Philadelphia will grow its way out of its problem," said Sam Katz, a three-time mayoral candidate and former chairman of the Pennsylvania Intergovernmental Cooperation Authority, a state-appointed board that monitors the city's finances. Of the city and School District budgets combined, he said: "We are approaching $8 billion in government spending. … Philadelphia's capacity to support that is under stress." Among the metro areas where the Bureau of Labor Statistics tracks job growth, the Philadelphia Metro Division – which includes the city and neighboring Delaware County — in December had the highest unemployment rate, 5.8 percent, and the second-slowest long-term job-growth rate of metro areas in the country. The bureau found 943,000 people working in Philadelphia and Delaware County at the end of 2017. That was up from fewer than the 850,000 it recorded in 2009, the worst year of the recession. But other big cities and metro areas have notched larger gains. In fact, Philadelphia and Delaware County employers had almost as many workers back in 1990 as they do today, according to the bureau. Since then employment has grown more slowly in Philadelphia than in Detroit or Newark, N.J., and far more slowly than in San Francisco, Seattle, Dallas, and other growth centers. Katz thinks the sluggish growth in the region is related to decisions made in City Hall. "Our economy has remained fairly flat, relative to the region. … One of the reasons I think has been taxation," Katz said. Katz said that if city officials want to invest in the schools, they should consider selling off assets such as Philadelphia Gas Works, the airport, and the parking authority to avoid an increase in taxes. 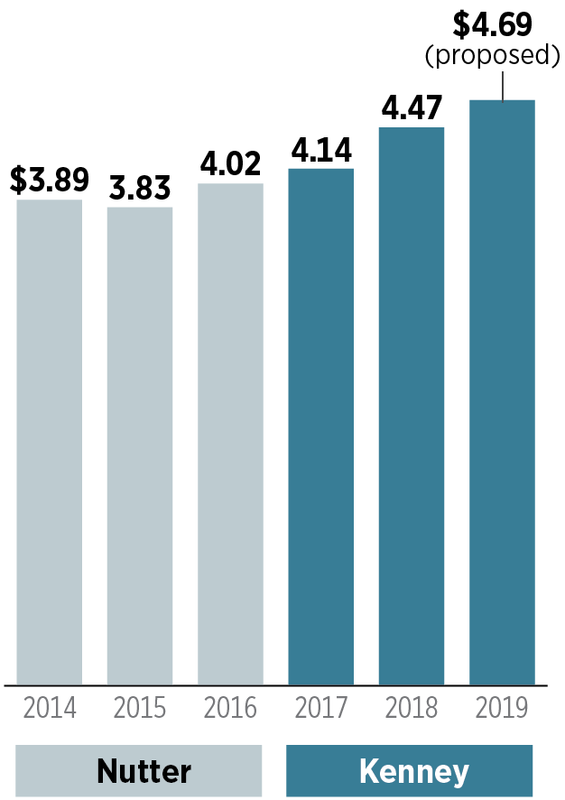 The revenue from such a sale, he said, could infuse the pension fund with much-needed cash. The city's pension fund is now eating up 15 percent of the general fund and will continue to increase in the next few years. "If you cut pension liability by $2 billion, you could put that in the schools" to the tune of $200 million annually from the general fund, Katz said. Marc Stier, executive director of the Pennsylvania Budget and Policy Center, said cities all over the state were getting hit by cuts from state and federal programs. "Local government is the ultimate bearer of bad decisions at the state and federal level," Stier said. "The reason the city budget has to grow is because the state budget has been shrinking." City Council will ultimately decide on the size of the budget. In recent history, its members have voted to increase spending even more than the mayor proposed — to the tune of $60 million last year. Councilman Allan Domb said he would like to see some efficiencies in government before increasing spending. The real estate mogul advocates for cutting what he says is overhead in the city's budget, as well as collecting delinquent taxes and other measures he thinks would save the city millions without increasing taxes. "In the private world, the first thing you do when finding ways to make ends meet, you try to cut overhead, try to negotiate better contracts, try to reduce costs, and the last thing in the world is raise your costs," Domb said. "In government, first thing we do is increase costs." Domb said he supports Kenney and wants to help fund the schools and would be open to a 1 or 2 percent property-tax increase but only after other measures have been taken. "Let's look inside before we go outside and charge our customers," he said. The other concern some budget experts have is the amount of money Philadelphia has at the end of a fiscal year. For fiscal year 2019, that is expected to be $128 million, less than 3 percent of appropriations. "While a rainy day fund could prove beneficial, the necessity to make the crucial investments outline above makes setting aside such funds more difficult," Dunn said. The city's goal is to get to at least 6 percent of revenues into the reserve fund. Even that would be far below other cities. "The recession is still very fresh for many cities. So, many of them are saving," McFarland, of the National League of Cities, said. "We are seeing ending balances grow to an average of 20 to 25 percent of expenditures." Staff writer Joseph N. DiStefano contributed to this report. The story has been updated to correct the amount that could be earned by selling or leasing city assets such as the gas works, airport and parking authority.